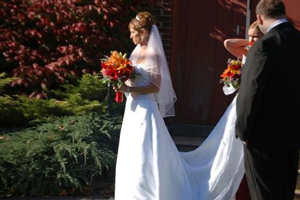 For Wedding DJs in Chicago and the Chicago Suburbs, ASAP Entertainment has 30 years of experience working with Brides and Grooms. 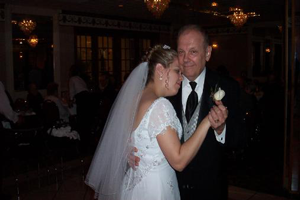 The following is a typical format for our wedding DJs for receptions performed by ASAP Entertainment. As with everything that we do, we will customize the reception to meet your personal preferences. The bride and groom will be contacted at least one week before the wedding to discuss music selections, verify first dance, bridal party dance, attendants names for the introductions, introduction music, and parent dances. 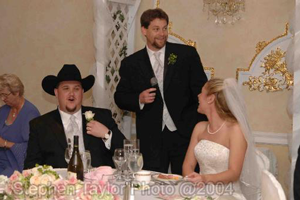 Your Chicago Wedding DJs will set up equipment and perform sound check one hour prior to scheduled start time. Speakers will be raised for cocktail hour and dinner, and lowered for dancing. We introduce ourselves to the banquet manager. We coordinate with the banquet staff. We ask what time dinner will be served, and at what time they would like the bride and groom to cut the cake. Guests arrive to easy listening music. The purpose of music during cocktails and dinner is to set an atmosphere. Volume is kept at a conversational level. The average reception lasts only 5 ½ hours. This is more than enough time to host an enjoyable evening of dinner and dancing, but to conserve some time you should decide if you want to have a receiving line, or should you go around to the tables after dinner. Depending on the size of your guest list, walking around to all of the tables can take as much as an hour. During this time the DJ will continue playing music, but the guests will wait to dance until the bride and groom have finished visiting the tables, and have done their first dance. A receiving line takes less time than greeting guests at the tables. If you don’t have a preference I would like to suggest a receiving line. 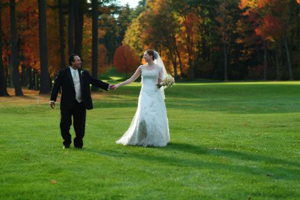 Your DJ will find an area near the room entrance, line up the bridal party, parents, and bride & groom, in that order. An announcement will be made, that all guests are welcome to greet the bride and groom by going through the receiving line. Our DJs work closely with the photographer and videographer. It is our job to make sure that they are apprised of all of the evening’s activities. We inform them prior to the introductions, cake cutting, first dances and the bouquet and garter toss. We tell them what time we will be introducing the bridal party. We ask them if they have any instructions such as, which entrance to use, what path they want the bridal party to take to their table, and whether or not they want the couples to pause for photographs as they enter. “Ladies and gentlemen, dinner will be served shortly. At this time I would like to ask all of you to please take your seats, I will need the members of the bridal party, parents and the bride and groom to retreat to the lobby to prepare for the introductions, thank you”. Light jazz music is played as the DJ joins the bridal party in the lobby. All those that will be introduced are lined up in order, checking the pronunciations of their names. Instructions previously discussed with the videographer and photographer are passed on to the bridal party. The music played during the introduction of the bridal party, should reflect your personality. Do you want something humorous and fun, or something a little more traditional. Think of songs that suit you best, or choose from the suggestions on our music page. Before dinner you may choose to have a prayer or blessing. 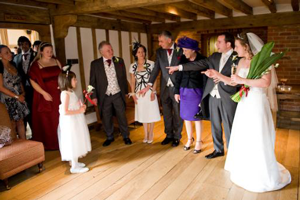 You can choose the reverend or priest if they are present or a relative or friend of the family. After everyone is seated, it is time for the toasts and speeches. Traditionally it is the responsibly of the best man, to provide the toast, but the Maid/Matron of Honor may make a speech as well. The DJ will provide a wireless microphone for this purpose. Dinner music is intended to create an atmosphere not to detract from table conversation. The volume levels are constantly checked by walking to all four corners of the room, keeping the music pleasant, not obtrusive. We talk to the guests seated directly in front of the speakers to make sure that they are comfortable with the sound levels. 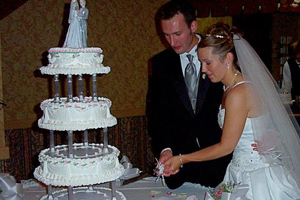 The cake is normally cut right after the bridal party introductions or during dinner. If it is being served for dessert it must be cut early. If it is to be wrapped for the guests to take home, it can be cut at the end of dinner. Your Chicago Wedding DJs will play music as the cake is being cut. The music is still kept at conversational level. As dessert is being served, we play upbeat easy listening, light adult contemporary or light blues, such as Mustang Sally, or Sweet Home Chicago. We try to get the dancing started as quickly as possible, at the conclusion of dinner. When the bride and groom are ready, we will talk to the banquet manager to have the hall lights dimmed, and make sure the photographer is ready. The DJ will now play the songs requested for father/daughter, mother/son, mother/daughter, etc. Then afterwards, the bridal party is called to the dance floor. Music played for dancing is a combination of requests from the bride & groom, their guests, and the Disc Jockey. The selections that the DJ plays are carefully chosen from a list of proven crowd pleasers compiled by ASAP Entertainment services. The bouquet and garter toss are usually done an hour after the first dance. We’ll make sure the bride is ready and advise the photographer that he has a few minutes before we start. “At this time we need all of the single ladies on the dance floor.” The DJ plays music as the women come out to the dance floor. You can choose song suggestions in our music book. When the bride has thrown the bouquet, it is time for the garter toss. The bride should sit in the chair, the groom should wait to remove the garter until all of the single guys come out. Music is played while the guys come out to the dance floor. You can choose songs from suggestions on our music page. “We need all of the single guys on that side of the dance floor, and the groom on this side of the dance floor. ASAP ENTERTAINMENT HAS YOU COVERED! With decades if experience, and a team of talented entertainers armed with the most sophisticated and advanced equipment in the industry, you can count on ASAP Entertainment for all your needs - from Professional Wedding DJ's, Karaoke and Trivia Hosts, and Private Parties, we have you covered.